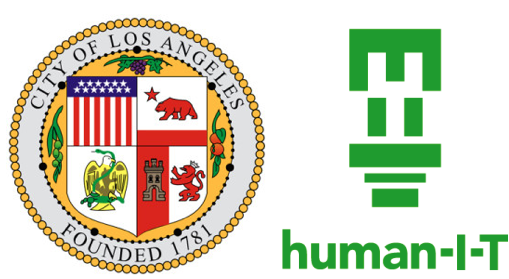 Los Angeles—Today human-I-T, in conjunction with the City of Los Angeles and other non-profit partners, unveiled OurCycle LA, a new program to refurbish City computers slated for replacement and give them to Angelenos in need. Computers not suitable for refurbishment will be recycled by a local e-waste social enterprise company committed to providing job training to previously incarcerated Angelenos who face barriers to employment. The program is the first-of-its kind for California and one of a few in the nation. It identifies underserved areas in our community as it pertains to Internet connectivity and fills in those gaps by. After the donated technology is collected, it is then refurbishes and sanitized, meaning all the data is wiped from it for security purposes. OurCycle LA will then find a home for the technology by matching it with individuals who qualify for the OurCycle LA program. Each computer system that goes out is paired with a low-cost internet solution and digital training to ensure the greatest impact. To date, the City of Los Angeles has collected 10,000 computers, monitors, and peripherals. human-I-T is responsible for the refurbishment of the technology, security and ongoing digital training of program recipients. “Closing the digital divide is a monumental issue facing our generation,” said Gabe Middleton, Co-Founder and Co-CEO of human-I-T. “There is a significant need for technology in America today; 50 percent of jobs currently require tech skills, but the U.S. is only ranked 24th for access to personal computers in homes. The refurbished computers will either be donated to non-profit centers that provide computer labs to low-income communities or given directly to families who have never had high-speed internet at home. Non-profit recipients are determined by a lottery through LA Shares, and individual participants are recruited by Community Build and the Koreatown Immigrant Workers Alliance. The City of Los Angeles, which reviewed human-I-T’s infrastructure in developing the model for OurCycle LA and creating a 360-degree approach in taking unwanted technology and creating a second life for it, is transforming how people think about technology and how they discard of it once no longer needed. This is the future standard of technology and reducing e-waste. Most unused technology in the United States, 80 percent, is unused and discarded in landfills while only 13 percent of it is recycled. Through this program, human-I-T has trained dozens of volunteers on computer components and refurbishment and, to date, more than 1,500 volunteer hours have gone toward this project. For more about today’s announcement, follow the conversation on Twitter at @right2tech. For more information about OurCycle LA, visit ourcyclela.com. Digital Exclusion in the U.S.
Transforms unwanted or inoperative technology into operational and educational tools for the millions in need. Striving to go beyond recycling by taking a progressive approach to E-waste.